Commanding magnificent views over the city of Tangier and the Atlantic ocean to the coast of Spain in the distance, the villa is a surrealist design constructed from re-inforced concrete. It is many miles away in character from the monumental concrete buildings of Auguste Perrot, Erno Goldfinger, and Swiss architect Le Corbusier which helped define the brutalist architectural style popular from the 1950s into the mid 1970s. 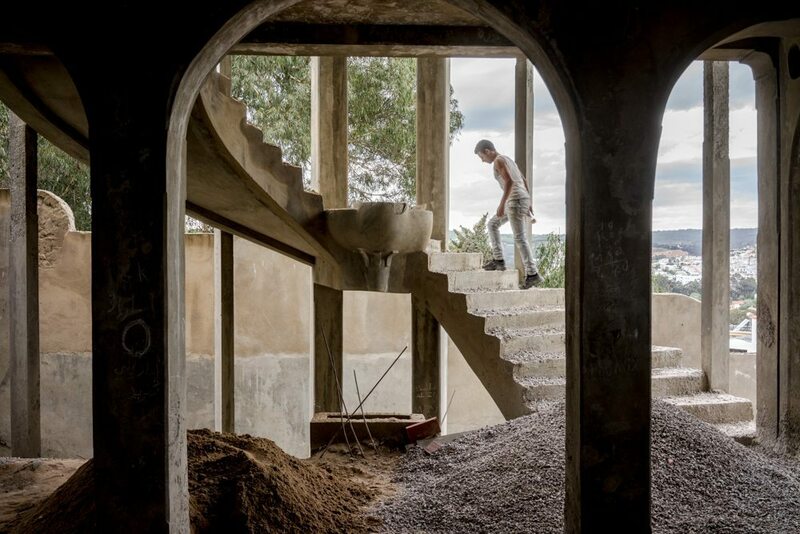 Berber architect Mokhtar El Boufounas’ building in Tangier, although built entirely from raw concrete and large and dominating, is still far from completion. It can conservatively be described as having a greater affinity with Antonio Gaudi, Salvador Dali or Pablo Picasso than its monumental cousins; its definite Spanish roots accord synchronously with its views of the Andalusian Costa de Luz only 20 miles away. Dolphins playfully hug its 4 corner pillars and a huge concrete crown, eagle and plane sit upon its roof. Inside there are ornamentations, cutaways and organic designs which add to the theme of playfulness and lightness. A huge staircase winds its way up one side of the structure, massive windows allow the stunning vista to be seen from most of the inside of the building and behind it work is continuing on a swimming pool, where reputedly a large boat will float and provide alternative accommodation, adding to the wonders on display . Two huge sinkholes are being drilled to find water and, so far at a depth of over 100 feet no water has been struck and large mounds of earth and mud attest to the depths being navigated. A garage with a car lift will park vehicles onto the first floor. Unfortunately the Moroccan authorities have not shared the vision of Mokhtar el Boufounas and recently, due to some planning infringements including obstructing the coastal view of other properties, the crown, plane and bird have been destroyed by building regulators, as have the pillars of the large windows overlooking the road on the first floor. Bare metal wires now abstract from broken concrete, twisted into their own sculptural shapes and designs, like a miniature Ground Zero. Workmen have converted smaller rooms into living quarters and their efforts continue at restoring shattered concrete into architectural order, but the work is slow. The worker’s foreman, himself a Berber, explains the background to the events, the difficulties they have faced and the lack of certainty as to when the project will be finished. The debris of the destruction will need to be removed and restored as permitted, the wells finished, interior walls completed. Huge panes of sliding glass will need to be installed with massive metal designs of rustic Moroccan scenes fitted onto the exterior. A large organically designed bread oven sits on a concrete floor awaiting installation, attached to some form of heating flues or pipes. The foreman speaks slowly and eloquently of both the project and proudly of his own family; of his wife at home near Fez and of his daughter at university in Spain, a further reference to the symbiotic relationship existing between Spain and north Morocco, where it had a former protectorate role. He does not know ( or will not tell ) how much Mokhtar El Boufounas has spent on the project or when it will end. He does know it is unlikely to be completed by Spring 2016 when the Villa is meant to feature in an American movie production. Some scenes from the new James Bond film SPECTRE were shot in Tangier and local buildings were renovated as part of the overall deal; perhaps some Hollywood funding will help promote its conclusion as well as funding some settlement with local planning authorities. After 12 years work the Villa is still to be given a name which in itself is perhaps a metaphor for its constant ongoing development and redesign. It somehow seems destined to remain uncompleted and, within a world of harsh realities which gives small favour to artistic visions or dalliances, merely a dream within an architect’s mind. I hope that Mokhtar El Boufounas finds a way through the bureaucracy of creative vision and planning reality to ultimately realise his elusive creation.